The anti-PM/Scl autoantibodies are known to characterize a subset of autoimmune patients with myositis, scleroderma (Scl), and the PM/Scl overlap syndrome. The major autoantigens that are recognized by anti-PM/Scl autoantibodies are designated PM/Scl-100 and PM/Scl-75. These autoantigens have been reported to associate into a large complex consisting of 11 to 16 proteins and to play a role in ribosome synthesis. Recently, it was discovered that the PM/Scl complex is the human counterpart of the yeast (Saccharomyces cerevisiae) exosome, which is an RNA-processing complex consisting of 11 3' → 5' exoribonucleases. To date, 10 human exosome components have been identified, although only some of these were studied in more detail. In this review, we discuss some recent advances in the characterization of the PM/Scl complex. Autoantibodies are the hallmark of many autoimmune disorders, such as the connective-tissue diseases scleroderma, systemic lupus erythematosus, Sjögren's syndrome, idiopathic inflammatory myopathies (IIMs), rheumatoid arthritis, and mixed connective-tissue disease. Although their etiology and pathogenic role remain unclear, many different autoantibody specificities have been characterized. Some of these autoantibodies are very useful as diagnostic markers and may also have a prognostic value, as has been shown for anti-double-stranded-DNA antibodies in systemic lupus erythematosus and anti-cyclic-citrullinated-peptide antibodies in rheumatoid arthritis [1,2]. Other autoantibodies have proved to be valuable tools to study cellular processes in which the autoantigens are involved, such as the splicing of precursor messenger RNAs (pre-mRNAs) mediated by the autoantigenic U small nuclear ribonucleoprotein complexes (U snRNPs) . Similarly, autoantibodies directed to a protein complex, known as the polymyositis–scleroderma (PM/Scl) complex, have contributed to the discovery of a large RNA-processing complex, which is now known as the human exosome. Here we present an overview of recent studies that have led to the current biochemical and functional understanding of the PM/Scl complex. The anti-PM/Scl autoantibody, formerly known as anti-PM-1 , may be detected in sera of patients with myositis, scleroderma, and PM/Scl overlap syndrome, although some patients positive for anti-PM/Scl autoantibodies may not have either of these conditions [5,6]. The patient group positive for anti-PM/Scl antibodies is characterized by an elevated incidence of Raynaud's phenomenon, arthritis, pulmonary disease, and calcinosis [7,8]. In general, patients positive for anti-PM/Scl antibodies respond well to immunosuppressive therapy and have a good prognosis [5,7,8]. In contrast to the findings in large North American and European cohort studies, the PM/Scl autoantibody was not detected in sera of Japanese patients with inflammatory muscle disease, which suggests that specific environmental or genetic factors are involved in the induction of this autoantibody response [9,10,11,12]. Indeed, an assessment of the HLA-DR genotypes of anti-PM/Scl-positive patients revealed a 75–100% correlation with HLA-DR3 [7,13,14]. The complex that is recognized by the anti-PM/Scl auto-antibody has a sedimentation coefficient of 20S as determined by sucrose-gradient centrifugation and was reported to consist of 11 to 16 proteins [15,16,17]. Proteins identified in these studies had molecular masses ranging from 110 to 20 kDa in SDS–PAGE [16,17]. Inconsistent data were reported with respect to the phosphorylation of some components [4,16,17]. Western blot analyses of patient sera positive for the anti-PM/Scl autoantibody revealed that the major autoantigen is the 110-kDa protein (PM/Scl-100), although some sera also recognized the 80-kDa protein (PM/Scl-75) [16,17]. Two cDNA clones encoding possible splicing variants of the PM/Scl-100 autoantigen have been isolated and characterized [18,19]. The PM/Scl-100 autoantigen contains several linear epitopes, but the major epitope is located in the N-terminal region (amino acid residues 232–241) . The other autoantigenic component of the PM/Scl complex, PM/Scl-75, was shown to be a protein with a predicted molecular mass of 39 kDa. Its very acidic C-terminal tail probably accounts for the aberrant migration of this protein in SDS-PAGE . Recognition of the PM/Scl-75 autoantigen by autoantibodies is primarily dependent on this C-terminal region (amino acid residues 196–355) . Immunolocalization studies showed that the PM/Scl autoantigens are present in the nucleoplasm and, at higher concentrations, in the nucleolus [16,17,22]. Like other nuclear substructures, the nucleolus is not separated from the nucleoplasm by a membrane, and its formation is presumably the result of local accumulation of numerous functionally related factors [23,24]. The nucleolus is the site of ribosome synthesis, which involves the transcription and nucleolytic processing of precursor rRNAs, the nucleotide modification of rRNAs, and the assembly of mature rRNAs with approximately 80 ribosomal proteins into small and large ribosomal subunits [23,24]. Electron microscopy reveals that the PM/Scl autoantigens are predominantly localized in the granular compartment of the nucleolus, which is the site of ribosome assembly . Inhibition of rRNA transcription by actinomycin D resulted in the nucleoplasmic rather than nucleolar accumulation of the PM/Scl autoantigens, a finding that also supports the idea that PM/Scl autoantigens play a role in ribosome synthesis . Except for some similarity with members of the serine/threonine protein kinase family , very limited functional information could be deduced from the polypeptide sequence of the PM/Scl autoantigens at the time of cloning [18,19,21]. However, more recent sequence analyses revealed that PM/Scl-100 and -75 are homologous to RNA-degrading enzymes of Escherichia coli, namely the 3' → 5' exoribonucleases D and PH (RNase D and RNase PH), respectively . In yeast (Saccharomyces cerevisiae), 11 proteins, 10 of which are known or predicted to have 3' → 5' exoribonuclease activity, were purified as a single complex that is referred to as 'the exosome' [26,27]. Ten components are essential for yeast viability (Rrp4p, Rrp40–46p, Mtr3p, and Csl4p); one component, Rrp6p, is nonessential, although deletion of the RRP6 gene leads to impaired growth and temperature sensitivity [26,28]. As summarized in Table 1, homologues for most of the components have been identified in E. coli and humans. 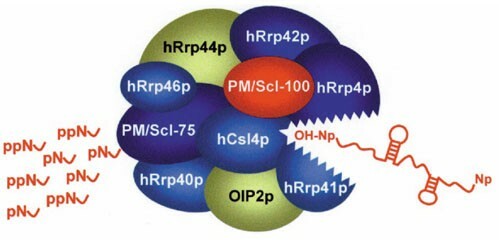 Notably, two yeast exosome components, namely Rrp6p and Rrp45p, are homologous to the PM/Scl-100 and PM/Scl-75 autoantigens, respectively (see also below). To date, no structural data have been presented, although two speculative models for the organization and activation of the exosome subunits have recently been proposed [29,30]. Several lines of evidence suggest that at least two different exosomes exist . First, the 10 essential components were purified with apparent stoichiometry, while approximately one-fifth as much Rrp6p was recovered. Second, two complexes, only one of them containing the Rrp6 protein, could be recovered from fractionated whole-cell extracts. Third, no cytoplasmic Rrp6p could be detected by immunolocalization, in contrast to the nuclear and cytoplasmic presence of Rrp4p and Rrp43p [26,31]. Finally, functional studies, as described below, suggest the existence of a cytoplasmic and nuclear exosome complex. Together, these data indicate that the yeast exosome is present in the nuclear and cytoplasmic compartments and that these complexes differ by the presence or absence of Rrp6p, the yeast homologue of PM/Scl-100. The most important experimental approach to determining the functions of the exosome encompassed RNA analyses of yeast strains that were deficient for one or more components of the exosome. Conditional mutants were created for the essential genes, whereas the nonessential RRP6 gene was disrupted. In general, the accumulation of a particular RNA in a mutant yeast strain suggests that this molecule is the substrate for the depleted component, whereas a reduction indicates that the RNA is a product generated by the depleted component. Such analyses revealed that the yeast exosome is involved in the processing and degradation of several RNA species. The first function assigned to the exosome was its role in rRNA processing. In the nucleolus, four RNA molecules (5S, 5.8S, 18S, and 25S rRNA) and many proteins associate into ribosomes . Three rRNAs (5.8S, 18S, and 25S rRNA) are transcribed as a large, 35S precursor rRNA, which is processed via a cascade of endo- and exonucleolytic cleavages into the mature rRNAs. Yeast strains that were mutated in any of the exosome components showed multiple defects in the maturation of this large precursor RNA. One of these defects is indirect inhibition of early endonucleolytic precursor rRNA cleavages [31,33,34]. Another is ineffective final 3'-end processing of the 5.8S rRNA [26,27,28,33,34,35,36]. Third, a noncoding spacer RNA (the 5' external transcribed spacer) and some aberrant rRNA species that arise from the inhibited early endonucleolytic precursor rRNA cleavages are stabilized [26,33,34,36]. The function of the exosome is not restricted to the maturation of rRNA. The 3' processing of small nuclear RNAs that play a role in precursor messenger RNA splicing (the U1, U2, U4, and U5 snRNAs) or in the processing and modification of rRNA (small nucleolar RNAs; eg U3, U14, U18, and U24 small nucleolar RNA [snoRNA]) is also hampered in mutant exosome strains [36,37,38]. Moreover, the exosome has been shown to compete with the splicing apparatus for unspliced nuclear mRNAs in order to degrade these pre-mRNAs [39,40]. The cytoplasmic exosome subfraction is probably involved in the degradation of mature cytoplasmic mRNAs, since mutations in the RRP4 and RRP41 genes inhibited 3' → 5' mRNA decay . Characterization of the yeast exosome has greatly enhanced our current knowledge of the human PM/Scl complex. At present, a number of studies have provided evidence that this complex, as schematically represented in Fig. 1, is the human counterpart of the yeast exosome, thus consisting of multiple 3' → 5' exoribonucleases. Schematic representation of the human exosome complex. The associations between individual components of the human exosome are hypothetical, since no structural data have been presented to date. All human exosome components analyzed so far (PM/Scl-100, PM/Scl-75, hRrp4p, hRrp40p, hRrp41p, hRrp42p, hRrp46p, and hCsl4p) are recognized by autoantibodies present in IIM sera, although some (PM/Scl-100, PM/Scl-75, and hRrp4p) are preferentially recognized. In one study, analysis of the composition of the yeast exosome led to the identification of two components, Rrp6p and Rrp45p, that are homologous to the human PM/Scl-100 and PM/Scl-75 autoantigens, respectively . To date, 10 human homologues have been identified for the yeast exosome components, as listed in Table 1 [18,19,21,26,35,42,43,44,45]. No homologues were found for Rrp43p and Mtr3p, whereas two human proteins (PM/Scl-75 and OIP2p) were the most homologous with Rrp45p . Since the PM/Scl complex was reported to consist of 11 to 16 proteins, additional human components may remain to be identified [16,17]. Conclusive data for a physical association with the PM/Scl autoantigens have been provided for hRrp4p, hRrp40p, hRrp41p, and hRrp46p by co-immunoprecipitation and cosedimentation experiments [26,45]. The size of the yeast exosome, its nuclear localization with nucleolar enrichment, and its role in rRNA processing correspond well to the properties that were previously suggested for the PM/Scl complex [16,17,22,46]. Indeed, more detailed characterization of the novel human components confirmed that some of the properties found for the yeast exosome also apply for the PM/Scl complex, or the human exosome. First, the human exosome was shown to exhibit 3' → 5' exoribonuclease activity. Four human homologues (hRrp4p, hRrp41p, hRrp44p/hDis3p, and hCsl4p) were able to suppress the growth defects of yeast strains that were caused by mutations in the corresponding yeast genes, indicating that these proteins are functionally conserved [35,42,43,45]. In addition, complexes that were precipitated from HeLa-cell extract using either rabbit antisera specific for hRrp40p and hRrp46p or a serum from a patient positive for anti-PM/Scl autoantibodies exhibit 3' → 5' exoribonuclease activity in vitro . As in yeast, at least two forms of the human exosome, which can be distinguished by the presence or absence of PM/Scl-100 (the homologue of Rrp6p), are likely to exist. This conclusion is mainly supported by studies that determined the subcellular distribution of hRrp4p, hRrp40p, hRrp41p, hRrp46p, and the PM/Scl autoantigens by HeLa-cell fractionation [26,45]. As in the yeast exosome, the analyzed components, except PM/Scl-100, were clearly detected in both cytoplasmic and nuclear extracts. PM/Scl-100, in contrast, was mainly present in the salt-extractable nuclear fraction, which is in accord with the previous observations made with patients' autoimmune sera that predominantly recognize this antigen [16,17,18,19]. On the basis of the subcellular distribution, it may be speculated that both nuclear and cytoplasmic functions of the exosome have been conserved during evolution. Approximately 5–8% of the sera from myositis patients, 3% of those from scleroderma patients, and 24% of those from patients with PM/Scl overlap syndrome contain the anti-PM/Scl autoantibody [5,9,46,47]. The autoantibodies that characterize this specificity are predominantly directed against the PM/Scl-100 antigen, whereas approximately 50–60% of the sera positive for anti-PM/Scl contain autoantibodies directed against the PM/Scl-75 antigen as well [9,16,17,48]. Novel components of the human exosome (hRrp4p, hRrp40p, hRrp41p, hRrp42p, hRrp46p, and hCsl4p) are also targeted by autoantibodies and some are preferentially recognized . In anti-PM/Scl-positive IIM sera, the prevalences of the anti-hRrp4p autoantibody and the anti-PM/Scl-75 autoantibody are similar (approximately 54%), but are not correlated . These results further support the hypothesis that the autoimmune response may initially be directed against the PM/Scl-100 antigen, whereas intermolecular epitope spreading may be responsible for the autoantibody response directed against the other, associated antigens. To date, the mechanism that triggers the initial autoantibody response is not known, but it could involve defective apoptosis (reviewed in ). Taken together, the data reviewed here indicate that the human PM/Scl complex closely resembles the yeast exosome in both composition and function and therefore may be referred to as 'the human exosome'. However, further studies are needed to support the functional homology between the yeast and human complexes. As the physiological role and composition of the human exosome become clear, one challenge will be to establish how and why this intracellular complex is targeted by autoantibodies in patients with IIM. All the components of the human exosome analyzed so far are recognized by autoantibodies present in IIM sera, although PM/Scl-100 remains the most important target. The identification and characterization of novel components of the PM/Scl complex offers the possibility of investigating the autoantibody response in more detail. = U small nuclear ribonucleoprotein.